In a perfect world, animals can live in peace with humans. People don’t eat the dead flesh of animals, don’t use their skin for clothes and preserve the Earth’s well-being. One of the ways to protect the Earth is to wear vegan running shoes. They have been made without any use of bioproducts so that they make your running pleasing without any harm to the environment. Vegan running shoes have the same properties as non-vegan running shoes with one huge advantage – they haven’t been tested on animals and they don’t have animal-derived ingredients. In a modern world, all well-known brands have lines of vegan shoes and many brands meet vegan standards. Here are the best vegan running shoes for men and women in 2018 and a buyer’s guide, which will help you to make your choice while buying the right pair. What Animal-Derived Ingredients Can Be Found In Shoes? Brooks uses eco-friendly materials for the manufacturing of the running shoes. Featuring a combination of reinforced stability and cushioning, the shoe has been designed for moderate and severe overpronators. The upper has a no-sew construction, it is stretchy and breathable. Besides, thanks to the upper, you may enjoy a glove-like feel. On top of that, moisture-managing Element mesh upper and sockliner technology keeps feet dry and cool. Comfort is top notch in this shoe and it is provided by padded tongue and collar. Besides, cushioning also contributes to the overall comfort. The updated midsole has a BioMoGo technology, which gives enough cushioning and it is environmentally-friendly due to the non-toxic additives. Besides, a full-length DNA midsole gives superior cushioning and stability as it adapts to every move. Moreover, each step is comfortable thanks to the full-length Segmented Crash Pad. The outsole of the shoe is made of abrasion-resistant HPR rubber, which is grippy and durable. Besides, there are Omega Flex Grooves, which encourage a natural movement. If you are passionate about trail running and want to find really great vegan shoes, then this is a perfect option. This is a minimalist shoe that has some decent features. The shoe upper is breathable and durable because it is made of synthetic, Thermoplastic Polyurethane, and mesh. Besides, there are upper overlays, abrasion-resistant sections around the midfoot, and a protective cap in the toe area. The shoe gives a natural feel so that there are better foot motion and control. The shoe has a Shoc-Zone midsole, which gives perfect cushioning and responsiveness and there is a decent amount of bounceback. As for the outsole, a Trailroc high-traction outsole ensures a perfect grip. Merrell is a well-known brand, which produces athletic shoes for different purposes. It has an impressive line of vegan-friendly shoes and uses labels to show whether the shoe is vegan-friendly or not. Meet Merrell Trail Glove 3 and hit the terrain in this durable, vegan-friendly shoe. The upper is breathable and durable because it is made of synthetic, mesh, and TPU. Also, the upper features reflective details for superior visibility in low light. Also, a unique Merrell Omni-Fit lacing System is integrated into the shoe. Therefore, the shoe provides a precise fit and the foot doesn’t shift. There’s cushioning at the bottom, but compared to its predecessors, it’s not as adequate as it should be. It is designed for trail running so that it is durable and breathable, the insole is comfortable and the outsole is grippy thanks to the Vibram technology. It means that the outsole features wide contact areas and rubber lugs for wider support. Mizuno is the brand, which is famous for high-quality shoes, which are vegan-friendly. The Wave line is famous for its comfort, stability, and flexibility. 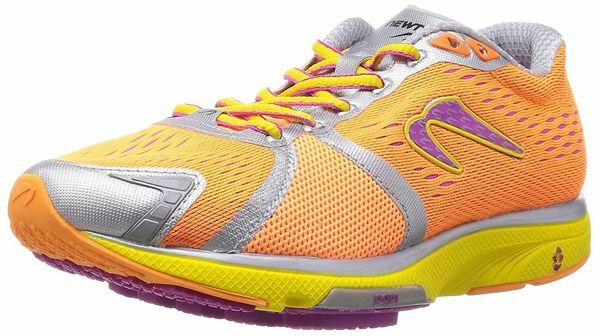 This version features a 10mm heel-to-toe drop, that is why the runner gets stability it requires. The shoe has many interesting features. The upper is mesh and breathable. The toe box cap and eyelets are made of suede, the tongue is woven and the toe box overlays are located underneath the upper. The midsole unit has stability wave plates, which also give dispersion and stability. The outsole is exceptional. A G3 outsole features a soft blown rubber in the forefoot area, whereas X10 high durability carbon rubber is located in the heel area. The outsole features flex controllers in the forefoot area so that you have a natural movement. Are you looking for great running shoes with a little structure? These sneakers give you enough support, decent stability and they have a 4.5mm heel-to-toe drop. There is a seamless mesh upper, which is breathable and responsive. The upper is cloth-like, but it is durable and comfortable. Besides, there is a 360-degree reflectivity for increased visibility in low light. The midsole gives responsive cushioning thanks to the EVA foam. Besides, there is an extended medial bridge for enhanced stability. The outsole is made of anti-abrasive rubber, which is grippy and reliable. The outsole has the Reaction Technology in the heel and forefoot areas. It ensures than external lugs move in accordance with the runner’s foot and add bounciness. Thus, the technology plays a paramount role in the energy return system. Brooks Glycerin 14 has been designed with comfort in mind so that each step you take is comfortable and your running brings you only a positive experience. The shoe is suitable for neutral runners and supinators, it features a 10mm heel-to-toe offset and provides maximum cushioning. The upper is made of synthetics and mesh so that the upper is breathable. The only drawback of the mesh upper is the lack of structural integrity. That is why there are 3D Fit Print overlays, which provide structural support. A TPU cage is stretchy and it offers a customized fit. The lace-up closure helps the foot to stay in its place and the padding on the tongue and collar enhance comfort. The midsole is made of an updated Super DNA rubber profile, which gives 20% more cushioning compared to the previous versions. Therefore, long and short runs become more comfortable as there is no extreme shock from hard landings. The outsole is made of a soft blown rubber, which is durable and lightweight. Besides, there is a Segmented Crash Pad that absorbs shock for smoother transitions. The shoe is designed for runners who need a shoe, suitable for races and for marathons. The synthetic and mesh upper is flexible and breathable. In fact, the shoe combines a bunch of technologies, which make it great for experienced and novice runners. The Reaction Technology is the technology, patented by Newton. Its main goal is to reduce energy loss. Also, there is a P.O.P 1 Technology which means that more rigid lugs are used to increase responsiveness and amplify efficient running. The midsole has a high-rebound EVA foam, which is responsive and cushy. The support and durability are also on top in this shoe. Thus, a Biomechanical Metatarsal Sensor Plate gives support in key areas of the foot. And the outsole is made of s.h.a.r.c (super high abrasion rubber compound), that is why it is highly durable. These vegan shoes have been designed for neutral runners and underpronators, who need additional cushioning. The mesh upper is flexible and soft, it is combined with a mid-foot wrap for additional support. The tongue and collar are padded and the sockliner provides rebound and resiliency with every foot strike. Parallel Wave® in the heel gives progressive support and lightweight responsiveness. U4ic midsole together with the Wave ensures a smooth heel-to-toe transition. The outsole is made of the updated X10 carbon rubber so that it is durable and absorbs shock. Besides, there are Smooth Ride flex grooves on the outsole for flexibility. This lightweight and stable running & racing shoe refers to the group of vegan running shoes. Saucony is one of the most respected brands in the world, and this model is a worthy brand representative. The upper is made of mesh, welded urethane, and synthetic leather. These materials are resistant to wear and tear. Besides, FlexFilm so-sew overlays make the upper lightweight and flexible. Also, the upper features RUNDRY collar lining material, that has moisture-wicking properties. Moreover, a ComfortLite Sockliner adapts to the contours of the foot and provides a comfortable fit. Saucony’s midsole EVERUN technology ensures perfect flexibility, shock absorption, and comfort. A TRI-FLEX outsole provides great traction and allows a great range of motion. It is made of IBR+, which incorporates both soft and hard blown rubber, which is durable and dynamic. Besides, the entire outsole is covered with XT-900, which enhances traction and durability. With Bare Access ARC 4 your long way home will be easier and more comfortable. The shoe with a full-foot connection and superior cushioning has been designed for trail running. These shoes look great and feel good because they are vegan-friendly. During the manufacturing, 0% animal products have been used. The upper is mesh and TPU, therefore, it is breathable and durable. There are reflective details, which improve visibility. As for the insole, it made of EVA and it is hyper-responsive. This long-lasting M Select Fresh insole has antimicrobial properties, it also prevents sweat and moisture and keeps the feet fresh. The EVA midsole gives great cushioning and responsiveness. The outsole is a real pride of these shoes. As the shoe is designed for trail running, the outsole is grippy. It has a Vibram technology, which means that there are lug patterns for stability so that there is good traction on wet and dry surfaces. Vegan running shoes should be free of any animal products of any kind. However, there are other factors you should take into consideration. There are three major types of pronation: neutral, supination, and overpronation. Neutral pronation means that the foot rolls inward about 15% after landing, that is why the best shoe type for neutral pronators are neutral shoes with good stability. Supination implies that the foot rolls inward less than 15%, that is why the shoes should promote a natural movement of the foot and should give efficient cushioning. Overpronation means that the foot rolls inward more than 15% and the best shoe type is supportive shoes with good cushioning and motion control. According to the research, vegan materials provide as much traction and grip as non-vegan materials. If you need seasoned shoes, then look for the shoes with spaced lugs for traction. Also, the outsoles with aggressive patterns make sure you feel confident on any surface. Vegan materials are lightweight, comfortable, and ensure great cushioning. Lightweight shoes provide a high level of performance. It doesn’t matter whether you use the shoes on intense runs or low-paced runs, you should be 100% sure that the shoe gives you enough protection. The toe box should have overlays for additional protection, the upper should be durable, the TPU overlays should provide midfoot support and protection. The cushy insole protects the foot from slipping as well as a grippy outsole with flex grooves and lugs. Vegan shoes aren’t less durable than their counterparts. So, the outsole, the midsole, and the upper should be made of durable materials. Synthetic microfibers, EVA, PU, recycled and virgin rubbers, canvas, fabrics, faux leather, TPU are the vegan products, which make the shoe durable. While choosing, pay attention to the materials. Look at the signs on the shoe to find out which materials have been used. Here is a table to help you. The shoes may provide minimum, medium, and maximum cushioning. If you have medium-height arches, then you need a fusion of cushioning and stability so that you can enjoy a maximum stride. If you have high arches, you need great cushioning to comfort the step and protect the feet. Here are five levels of cushioning. Always keep the type of terrain in mind while choosing vegan running shoes. If your passion is trail running, then the sneakers should be durable, water-resistant, the midsole should be cushy and responsive, whereas the outsole should have lugs for traction, and flex grooves for a natural stride. If you want to buy the shoes for road or treadmill, then don’t buy minimalist shoes with bad grip. Instead of it, buy a lower-profile running shoe, which will be lightweight, give sufficient arch support, and enough cushioning for comfortable movements. The shoes of an appropriate size guarantee you’ll enjoy your run without injuries and blisters. The feet swell after strenuous workouts and throughout the day, so it’s better to buy the shoes a half size larger. Synthetic materials make the shoe lightweight, durable, and breathable. However, some brands use non-synthetic materials, which blend with the animal skin. The materials are put together with the help of glues. Synthetic glue is cheaper to produce, it lasts longer and holds better. However, sometimes the synthetic glue may be tested on animals. Also, sometimes, the glue is derived from animal bones. Usually, the dyes are synthetic, but some brands use dyes, derived from animals. Even synthetic materials may be tested on animals. Therefore, the only way to find it out is to inquire with the manufacturer about where they source their adhesives from. Finding perfect vegan running shoes isn’t easy, so there are the most asked questions and answers that may help you. Are there any brands that make vegan running shoes? The companies, that produce vegan products are Brooks, Newton, and Mizuno. Also, such brands as ASICS, Saucony, Inov-8, Merrell have vegan shoes in their lines. While choosing vegan running shoes, also make sure that the manufacturer doesn’t test the products on animals or use animal by-products. Are vegan shoes as durable as non-vegan shoes? Many buyers confirm that vegan shoes show high marks of durability. Vegan materials are as durable as their counterparts. Are vegan running shoes more expensive than non-vegan shoes? No, the price of vegan running shoes is in line with non-vegan running shoes. When is it time to retire the running shoes? Vegan shoes have the same properties as non-vegan shoes have, so it is recommended to replace running shoes after 300-500 miles. So, if you want to buy vegan shoes, consider the mentioned factors. We affirm that men will get only positive running experience if they choose Brooks Beast 14. Brooks manufactures only vegan shoes, therefore, you may choose any model of the line considering your personal needs without worrying about whether the product is vegan or not. The shoe is designed for moderate and severe overpronators. Thus, it gives superior stability and cushioning. The upper gives a glove-like fit because it is stretchy and adjusts to the foot. Besides, there is a no-sew construction in the upper, the tongue and collar are padded so that you receive good comfort without irritation and another discomfort. The BioMoGo technology, used in the shoe, isn’t only environment-friendly, it also adapts to every move and gives stability and cushioning the runner needs. Extended Progressive Diagonal Rollbar (PDRB®) helps to prevent overpronation and gives a smooth transition throughout the gait cycle. The outsole is made of HPR rubber, which is both durable and grippy. As for women, who are looking for vegan running shoes, there is a wide range of options. Again, Brooks, Newton, and Mizuno are always safe choices, but other famous brands also offer vegan shoes in their lines. We recommend buying Mizuno Wave Rider 18. It’s been designed for neutral runners and underpronators. It allows using orthotics, which makes the feet feel comfortable and secure as it is designed to correct foot and ankle problems without the surgery. The upper is soft and flexible and it has a mid-foot wrap, which gives additional support. The Parallel Wave technology disperses shock throughout the sole and provides great cushioning and enhanced stability. U4ic midsole is 30% lighter than the material of the previous generation AP + and it gives great cushioning. X10 carbon rubber is durable and grippy. Smooth Ride flex grooves increase flexibility. Thus, choose running shoes in accordance with your needs and preferences, run in vegan shoes and enjoy every stride!